SCVHistory.com | Heritage Junction | Report: Callahan's Red School House Came from Emma Mine in Acton. Report: Callahan's Red School House Came from Emma Mine in Acton. And the desks came from Vallejo. Curator, Santa Clarita Valley Historical Society | n.d. (circa 1987). The standard version of the story is that the Little Red Schoolhouse that now stands at Heritage Junction Historic Park in Newhall was built in 1927 by Robert Callahan (1892-1981) at his Ramona Village/Mission Village Auto Court in Culver City. This version says Callahan found the little building in 1926 at the Emma Mine near Acton. Both versions come to us from historian Jerry Reynolds; it's probably most correct to say that according to Reynolds, Callahan took the building from the Emma Mine in 1926 and erected it at his Ramona (Mission) Village in 1927. 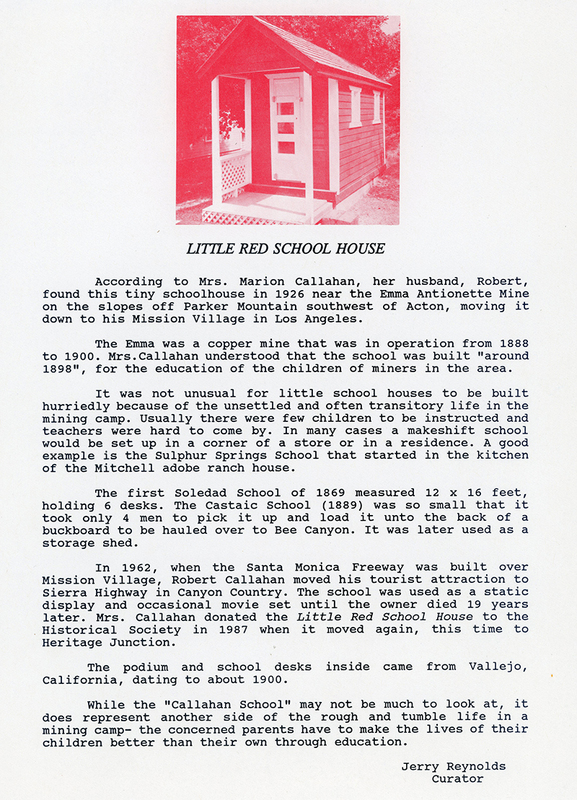 According to Mrs. Marion Callahan, her husband, Robert, found this tiny schoolhouse in 1926 near the Emma Antoinette Mine on the slopes off Parker Mountain southwest of Acton, moving it down to his Mission Village in Los Angeles. The Emma was a copper mine that was in operation from 1888 to 1900. Mrs. Callahan understood that the school was built "around 1898" for the education of the children of miners in the area. It was no unusual for little school houses to be built hurriedly because of the unsettled and often transitory life in the mining camp. Usually there were few children to be instructed and teachers were hard to come by. In many cases a makeshift school would be set up in a corner of a store or in a residence. A good example is the Sulphur Springs School that started in the kitchen of the Mitchell adobe ranch house. The first Soledad School of 1869 measured 12 x 16 feet, holding 6 desks. The Castaic School (1889) was so small that it took only 4 men to pick it up and load it [onto] the back of a buckboard to be hauled over to Bee Canyon. It was later used as a storage shed. In 1962, when the Santa Monica Freeway was built over Mission Village, Robert Callahan moved his tourist attraction to Sierra Highway in Canyon Country. The school was used as a static display and occasional movie set until the owner died 19 years later. Mrs. Callahan donated the Little Red School House to the Historical Society in 1987 when it moved again, this time to Heritage Junction. The podium and school desks inside came from Vallejo, California, dating to about 1900. While the "Callahan School" may not be much to look at, it does represent another side of the rough and tumble life in a mining camp &mash; the concerned parents have to make the lives of their children better than their own through education.